It is one of the most pleasing salads for something green and crunchy and a nice break from leafy salads and a good option for a vegetarian meal salad. Buy the freshest beans you can. They should be deep green with no blemish, they should snap when breaking and not feel limp. Beans have a high content of moisture and chlorophyll and should be stored in a cool place and not in a plastic bag otherwise they exude their moisture rapidly and become slimy. Once cooked, you can dress the beans up to three hours in advanced to pickle them. For 1 ½ pounds of green beans. Remove hard ends of beans and cook the green beans in a generous amount of boiling water till tender but still crunchy, al dente. Drain them and shock them in an ice cold bath. This should have the effect of stopping their cooking and bringing out the chlorophyll making your beans look freshly green. Directions: In a hot pan with a minimum amount of olive oil, sauté garlic onion, red bell pepper till tender but firm. Let cool. In a large bowl, drizzle of bit of olive oil over the cooked green beans, toss and mix in the cooked vegetable mixture. Add lemon zest, olives, and grape tomatoes. Dress generously and refrigerate till service. Before serving, return to room temperature, and add to salad crumbled feta and thyme or chopped basil. Taste and adjust salt and pepper. 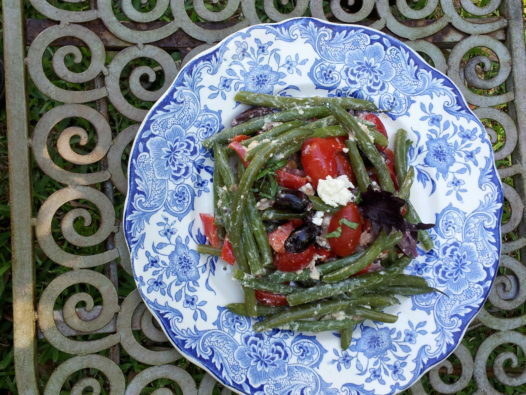 This salad holds well over a day, and also makes a good dish for a picnic.